A really fun way to make memories every Thanksgiving is to create a dish that has everyone talking. 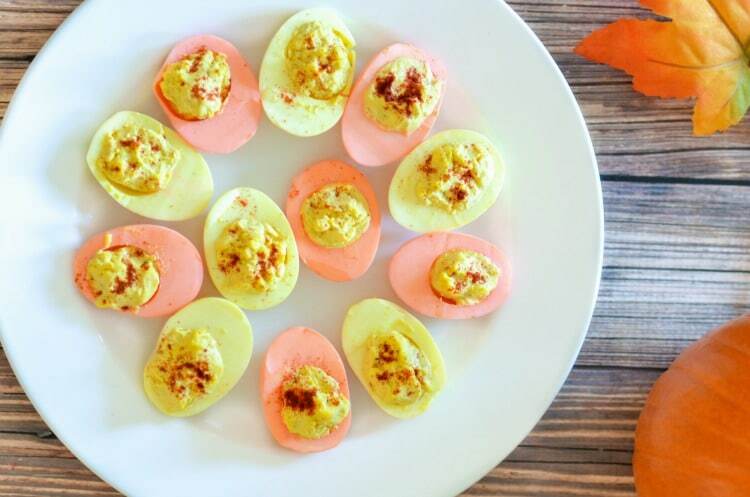 My colorful deviled eggs recipe is beautiful and will have everyone asking how you did it! This Thanksgiving appetizer recipe of colorful deviled eggs is a partnered both with Acorn Influence and their client. This Thanksgiving is going to be one of firsts. The first time I’m hosting Thanksgiving dinner. My husband and I cook a majority of Thanksgiving dinner every year but anyway, but knowing this year it will fall entirely on us. Our first Thanksgiving in Florida and the first Thanksgiving with my grandma. Now I should add that I was born in Florida and spent my first five Thanksgivings with her, but I don’t remember any of those. While the head count will still be the same (6 adults and 2 kids), we’ll be spending the day with 4 other adults that may have different expectations for the meal and different tastes than we’re used to. It may be a challenge but I’m hoping with a good game plan in place, we’ll make it through the day and everyone will be happy and well fed! My girls are constant grazers and ask for food all day long. Couple that with my grandma suffering from hypoglycemia and ensuring we have plenty of snacks while Thanksgiving dinner is cooking is a definite must. So I’ve been putting a lot of thought into creating appetizers that will appeal to the entire bunch. With limited store hours and so many other things going on, holidays are the worst time for kitchen disasters. So before I make the recipes on Thanksgiving Day, I wanted to test drive things out ahead of time. While picking up some eggs at Walmart last week, I bought a new brand of eggs. 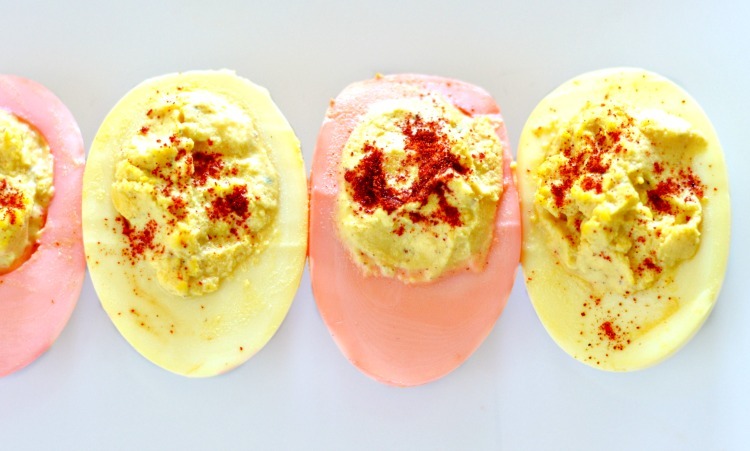 The Goldrich Eggs carton showed a bright yellow center and inspired me to make deviled eggs…with a twist. 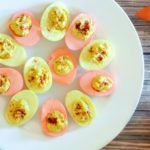 I really wanted to create a recipe that would be filling and appeal to everyone in the group and deviled eggs always seem to be a hit…except with my girls. So in hopes of getting them to eat, I decided to make this colorful deviled eggs recipe to at least encourage them to try. Not only that, being in a rented house, this is a fun way to create a little extra holiday cheer on the table! How do you get eggs to have colored whites? That’s the question I got asked by so many family members. Well, I am about to share my secret. Take them out when they are completely dyed to your liking. That’s it! You’ll have beautifully colored egg whites ready for your Thanksgiving meal. You can also get colorful with the egg filling. Try making them green with my avocado deviled eggs recipe! Want the printable recipe? 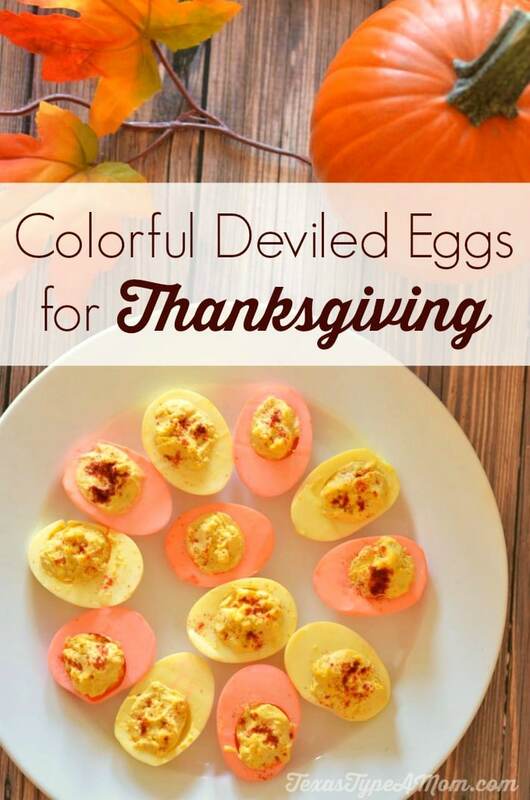 Here’s a printable recipe card of my colorful deviled eggs. 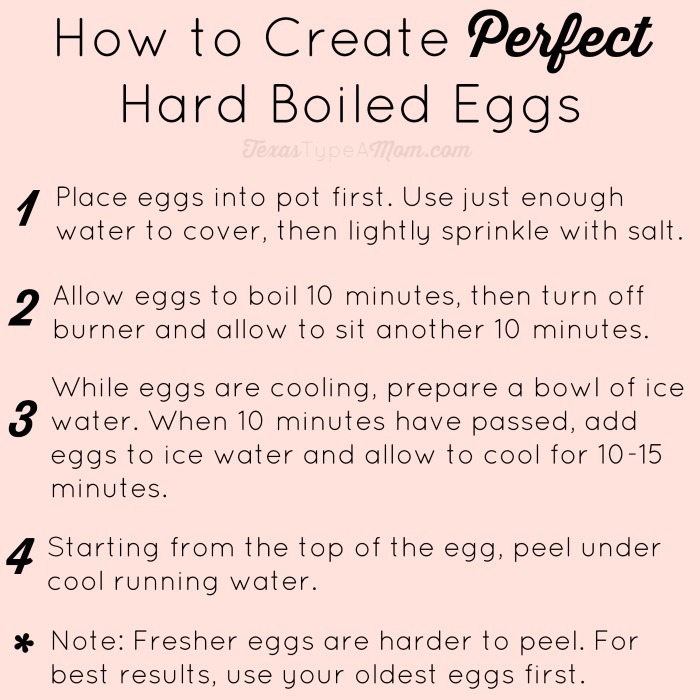 Boil eggs by placing in large pot and filling with just enough water to cover. Allow eggs to boil for 10 minutes, then turn off the burner and allow to sit another 10 minutes. Meanwhile, prepare bowl of ice water. Once 10 minutes have passed, add the eggs to the ice water and allow to sit in the water 10-15 minutes, or until they're cool. Peel eggs under cool running water. Slice eggs in half lengthwise and place yolks in small bowl. Using a fork, mash egg yolks, mayonnaise, mustard, salt, and pepper in bowl. Set aside. Depending on the number of colors you'll be using, add 1 cup of boiling water and food coloring to each bowl. Add as many egg halves to bowl as will allow to be completely flat and completely submerged. I erred on the side of lighter more pastel colored eggs, but if you want deeper colors you can allow to steep by lightly covering bowls with a paper towel. 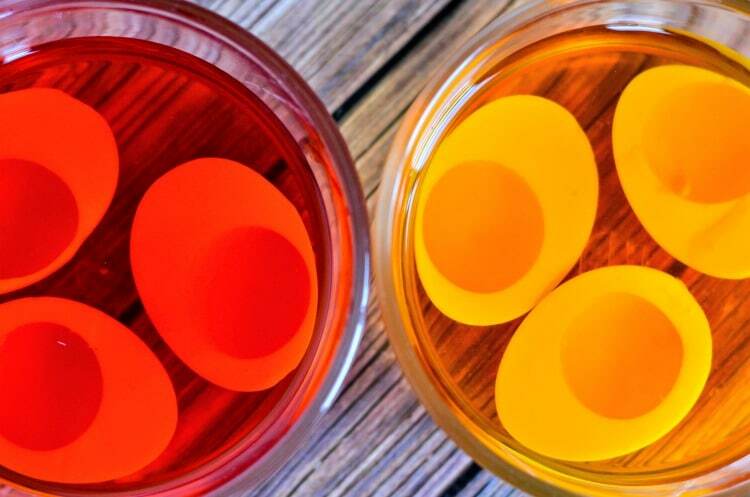 Remove eggs from bowl and allow excess coloring to dry on a paper towel. Spoon egg yolk filling into eggs and lightly sprinkle with paprika. Enjoy right away or chill for 30 minutes before serving. How do you hard boil an egg? Pin the graphic below to your cooking board. 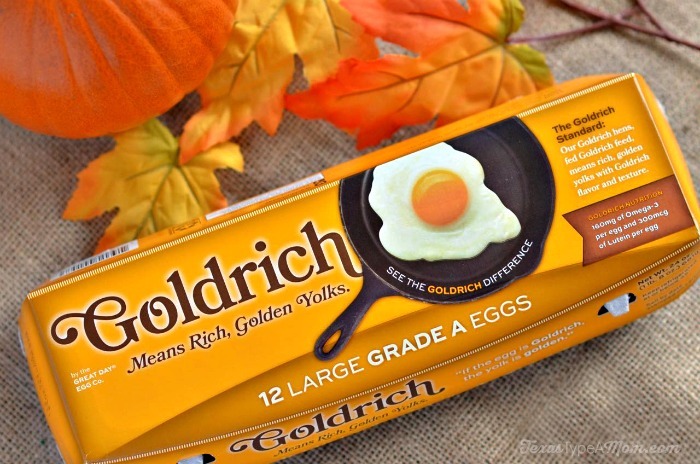 Learn more about Goldrich Eggs news by following them on Twitter and Pinterest. Oyster Dressing – Jazz up the Thanksgiving table with this incredible side dish. Butternut Squash Crostini – This is a delicious side dish. It can also be an appetizer before the main meal. Pumpkin Cupcakes – You have got to make these for dessert. They are way easier than pumpkin pie and taste better too. Cheesy Cauliflower Au Gratin – Sneak some extra veggies into your Thanksgiving dinner with this Julia Child classic. Herb Roasted Turkey – It’s way easier than it looks to make a moist and delicious turkey. « Save Time and Oven Space with these 25 Thanksgiving Crockpot Recipes! I will have to try this. I tried deviled eggs before and I ruined them. I am determined to make it work. Those sound SO good. I love deviled eggs! These have always been my favorite at family/office events. To be honest I had never heard of coloring eggs except on Easter. This is definitely interesting and I’d love to see how many pick the colored eggs over the regular.